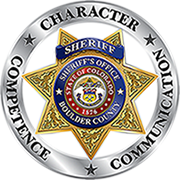 The Boulder County Jail is the responsibility of the Sheriff’s Office and is located at 3200 Airport Road in Boulder. As part of the mission statement that every inmate will leave the facility in better condition than they entered, the jail offers various programs designed to help inmates. These include GED testing, religious programs, and yoga. Find visitation times and requirements, or an inmate’s bond definition. Check out the alternative sentence and inmate worker programs. See who has been arrested in our daily booking reports, and the names of those still in jail in our listing reports.